I am so excited to share 1 of the two hotels I got to stay in while I was in Houston. So consider this part one of my hotel posts! 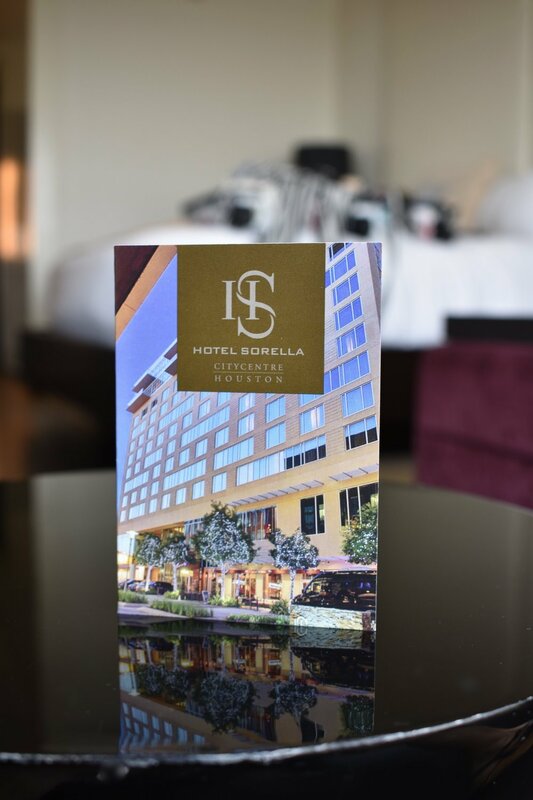 The first hotel stop on my Houston trip was Hotel Sorella. This gorge boutique hotel is located right in the middle of the CityCentre which is PERF because all the best shopping and food is literally surrounding the hotel. The location is a definite winner. Now lets talk about the room because y'all, it was perfection! Literally one of the best rooms with the best view ever! I love how spacious and open the layout was. It has such a modern sleek vibe, which I was definitely loving. The bathroom was SO WELL LIT! It made doing your makeup a freaking breeze. And obviously the VIEW THOUGH! After I unpacked, I just hung out for a bit to unwind and relax. I ordered some room service because hey, a girls gotta eat! Then it was time to hit the pool! Sorella has one of the most gorgeous pools you guys! I could have spent my whole stay lounging and swimming. Look how pretty that water is, it calls to you! The next morning I woke up after having one of the best sleeps in my Sorella bed. It was so hard to get out of bed, seriously you guys I wanted to stay in all day! I finally got up and showered. Of course I had to take a second and take in the view, I obviously am obsessed with it :P I put my makeup on and then went to check breakfast because I am literally always thinking of food! Can we just take a minute to admire the stunning breakfast that Sorella has though?? Like look at this yumminess y'all *insert heart eye emojis*. So. Many. Options! I went with fruits, a chocolate croissant, and one of their sweet potato scones. Of course coffee because like who doesn't drink coffee at breakfast?? If you guys have any questions or comments leave them below or find me on my socials and slide into my DMs! I love hearing from you guys. I hope you guys have had the best weekend and have a great week!